On Facebook recently, Derek Birks, author of Rebels And Brothers, a series set during the Wars of the Roses, wondered about differences between men and women in their reading habits and historical fiction preferences. I’ve had a look at the 2013 survey and here’s what I found. NOTE – I’m reporting here on areas where I think there are statistically significant differences. Read the full report and other selected posts for further information. Part 2 – favourite authors – can be found here. Within historical fiction, what type of story appeals to you? Top three for women: fictional characters within a backdrop of great historical events 71%; romance 44%; the life of a significant historical figure 40%. For women, two other reasons come close to the 40% figure suggesting that preferences are more varied. What historical time periods do you read? 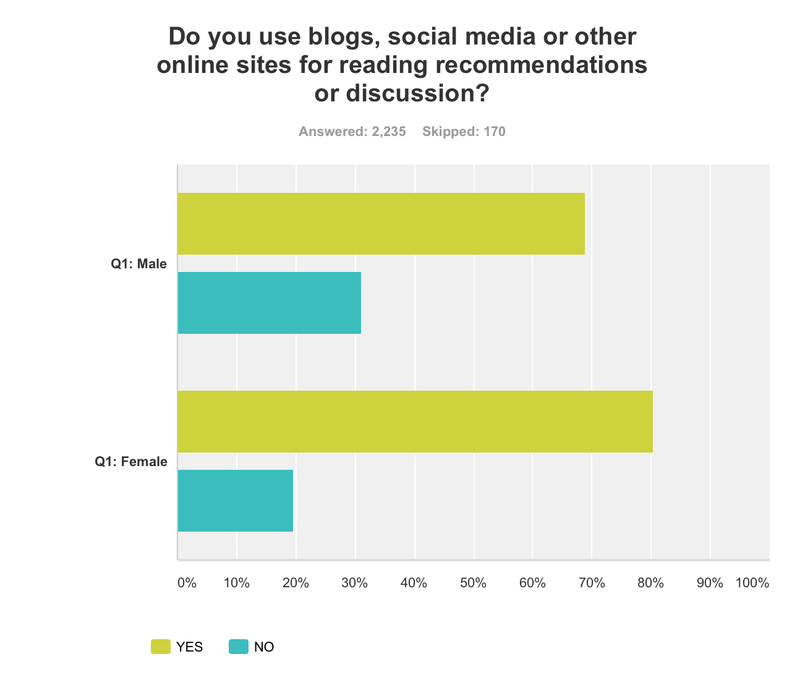 Use of Blogs, social media or other online sites For favourite historical fiction authors, have a look at an earlier post comparing men and women based on data from the 2013 survey. You can also check out my 2012 survey report. On visiting a charity shop on holiday recently they had sorted their fiction shelves into books written by men and books written by women. A first! I must do some research into my reading and the gender of the authors. I feel it is about 50/50. That’s interesting, Andrew, and it would drive me nuts to shop in a store like that. I never look if a book is written by a man or a woman.Although, once when I read a book about Lucrezia Borgia, I did look to see the background of the writer. When I noticed, that he was a script writer, I thought, “That explains why this book is the way it is.”The most important thing to me is if the story looks interesting. Someday, I hope I will be sufficiently acquainted with my own writing process that I will be able to incorporate useful figures like these into what comes out of the sausage grinder! Thought-provoking post! The author’s gender doesn’t really matter to me either. I look at the story. Honestly, I typically only read books that have a strong romance plot, but lately have discovered that my tastes are changing. As an example, I used to read more books like “Gone With the Wind” but am currently reading book about Thomas Edison, “Inventing Madness” by J.G. Schwartz http://www.inventingmadness.com/. A year ago I may not have even picked it up. Now I am really hoping they make it into a movie!! So final answer- I pay attention to the story plot, not the gender of the author. Thanks for stopping by, Liz. It would be interesting to consider how readers interests change with time – in my case, I think I look for more complexity in the novels I read than I did some time ago. I suppose in earlier days with small children to consider and a full time job, I only had time for quick reads! For me, the author’s gender is never a consideration as to whether I will read a particular book. You’re welcome! I think my tastes revolve somewhat around my children getting older as well… I find that as they get older I have more and more time to read than I used to.